To perfect new medicines and surgical techniques, scientists need to conduct experiments on real humans. The only problem is, there aren’t too many living people who want to be guinea pigs for untested drugs or procedures. Human cadavers will work, but it’s not the same as a living, breathing person. Now, scientists from Harvard University have partnered with the Defense Advanced Research Projects Agency (DARPA) to create a series of see-through computer chips that imitate the function of real human organs. 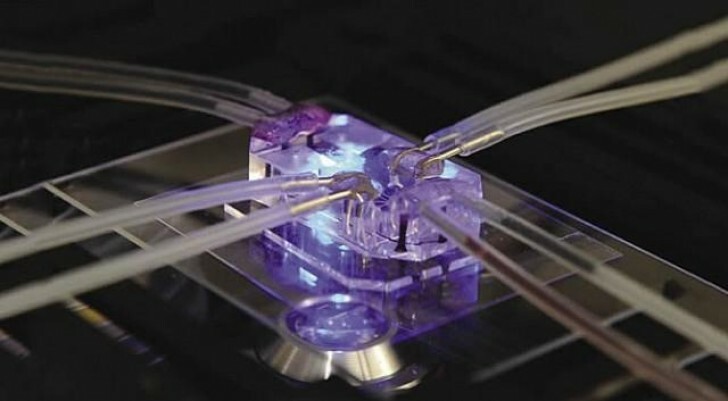 The organs-on-chips will allow researchers to study complex human physiology safely without a human subject. So far, experts at Harvard’s Wyss Institute for Biologically Inspired Engineering have designed small variety different microchip versions of human organs, including the lungs, heart, and intestine. Each faux organ is made from a clear flexible polymer and is about the size of an average computer memory stick. 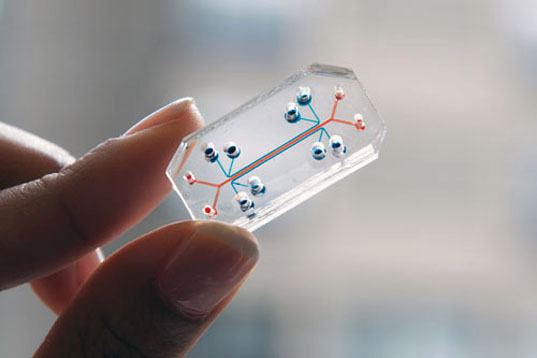 The microchip organs feature hollow microfluidic channels that are lined with living human cells. Although they don’t resemble the real shape of these organs inside the body, the cells allow scientists to observe how these organs might react to new drugs. This process could greatly reduce the number of unsafe drugs that make it to the market, since early stages of “human” testing could be accomplished without having to gather and monitor real study participants. Being able to test drugs directly on a fake human body could eliminate the need for animal testing as well. To perfect new medicines and surgical techniques, scientists need to conduct experiments on real humans. The only problem is, there aren't too many living people who want to be guinea pigs for untested drugs or procedures. Human cadavers will work, but it's not the same as a living, breathing person. Now, scientists from Harvard University have partnered with the Defense Advanced Research Projects Agency (DARPA) to create a series of see-through computer chips that imitate the function of real human organs. The organs-on-chips will allow researchers to study complex human physiology safely without a human subject.